You are here: Home / online shopping / Just Fab: Possible FREE shoes or designer shoes for $20 shipped! If you love shoes, make sure you check out Just Fab! They’ve got designer shoes for just $39.95, and they are offering 50% off your first pair, which makes it just $19.95 shipped! Some people have even been able to score FREE SHOES! They’ve got sandals, high heels, flats, and wedges. They’ve got hand bags, jewelry, and more, too! 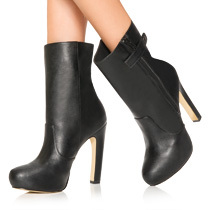 I spotted several pairs of super cute boots that they’ve just added. They would be perfect for the fall and winter months! If you also see a Cosmopolitan en Espanol offer in your cart at check-out, you’ll be able to get FREE shoes! There may also be other magazine offers available. Pick any that have a $20 value! 2. Then, choose “If you do not want a subscription to Cosmopolitan en Espanol and prefer instead to receive a refund, please fill out the form below and mail it along with your proof of qualifying JustFab purchase.” You can also choose others with a $20 value if they are available. Print your rebate form and submit it once you receive your shoes! If you don’t see the rebate form, you won’t get free shoes, but $19.95 is still a great deal! There are no monthly membership fees, all styles are $39.95, you can earn points toward FREE shoes in the future, and you get free shipping! Returns and exchanges are free, too! Did you get the free shoes offer?